Well, friends, here we are at the beginning of yet another campaign by Blogchatter viz Blogchatter Projects 2018 and I am simply thrilled to be a part of it. I am sure all of us will have a wonderful time together, promoting our dream ideas and I assume just like me, all of you are hoping to raise your pet projects to a satisfactory level of popularity by the end of this campaign. In this post, I will give you a brief introduction to my project. When I began blogging last year, I had not bothered to fix a niche for my blog. Actually, to tell the truth, I began blogging on a whim and never expected to last very long as a blogger. But somehow once I started, I realized I enjoyed writing and began posting quite frequently on my blog. Not having a niche meant I could just write whatever I pleased. I began with poems, then started writing articles and also added some photography. Finally, along came Blogchatter's eBook carnival and at that point in time, I realized that the one thing I had never written was a fictional story. I had written poems, articles and had even waded in photography, but I had never attempted writing fiction. So, as my first attempt at writing fiction, I wrote a short novella in the thriller fiction genre and published it as part of the Blogchatter eBook carnival. The eBook was titled ‘Eighty Hours To Save Karen’. You can gauge the popularity of the novella when I tell you that it was downloaded 312 times from the Blogchatter site and received rave reviews. Here are some excerpts from the reviews received and links to the reviews themselves. A Clean plot that which avoids sub-plots. A well etched out central character whom I rather liked. The mystery is taut and emotionally gripping. The ability of the author to solve the mystery in a clean linear line is commendable says, Dr Amrita Basu... Read the rest of the review here. Here is what Tomichan Matheikal has to say about the book. Sitharaam Jayakumar is a good storyteller. His e-book, Eighty Hours to Save Karen, kept me hooked so much so that I read it in one go this morning... Read the rest of the review here. From the first chapter itself, the plot hooked me to the book. I wanted to know more about the protagonist, his granddaughter and the red apple. The writer didn’t waste any time in building the plot. He just hit the bull’s eye in starting the thrill and the suspense from the first chapter itself... Read Priyanka Vermani's review here. Says Nupur Maskkara: The author’s the boss. This book at 94 pages is a quick read. That’s a good thing since it’s unputdownable. Although old, unusual for a protagonist, Mat is a good hero. Secondary characters are overshadowed by him... Read the rest of the review here. Says Lavanya Srinivasan: The protagonist’s character sketch and his background is skillfully fleshed out and the reader’s attention to drawn to the protagonist’s prejudices and familial attachments as the back story of family tragedies, his grand daughter’s multi-religious background and his forceful personality is described at the beginning of the novel... Read the full review here. Eighty Hours to Save Karen is a racy, engaging thriller that keeps the reader hooked and spooked till the last page says, Sona Grover... Read the full review here. Here is what Meghana Pawar has to say about the eBook. The book is a novella that can be easily read in one go, at least I found it easy enough to read it that way. It is easy flowing and interesting. The characters are built rightly, and the plot is tight... Read the rest of the review here. Encouraged by the reception I got I went ahead and published my eBook as a novella in Amazon. There has been some response but due to lack of sufficient marketing, the novella has not become as extensively popular as I had hoped. I was wondering what to do to make my eBook more visible in the public eye. I thought of marketing campaigns but most campaigns I found were rather expensive. Then I heard of Blogchatter Projects and I was informed that one can use the platform for book promotions. So, my project for this campaign is to promote my eBook ‘Eighty Hours To Save Karen’. I am championing Jithin S (Twitter handle - @jiths). Leha Divakar is my mentor. Here is the Amazon link to my eBook. The book can be read for free on Kindle Unlimited. My hashtag for blogchatter projects is #PromoteJaisNovella. Do use this hashtag while sharing my posts and tweets. I request all of you to read my book. Your feedback and comments are most welcome. All the best for promoting your book, Jai! 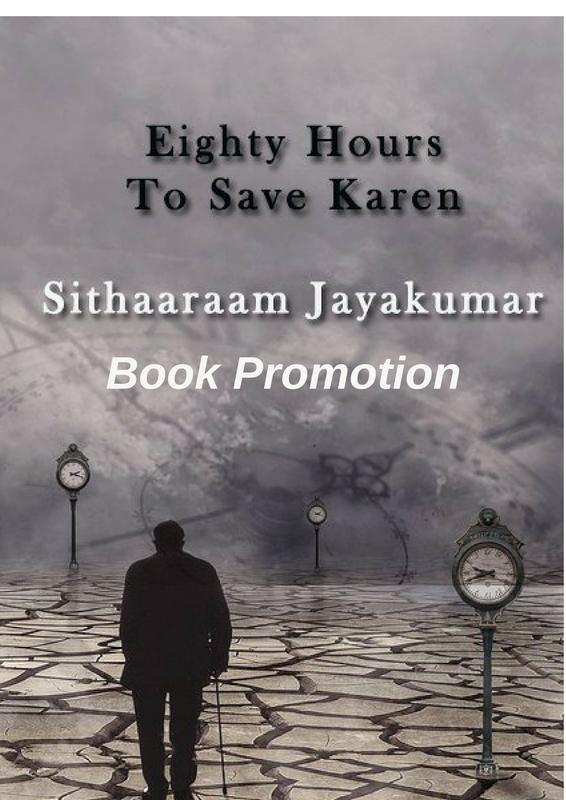 Eighty Hours to Save Karen is a fantastic read that Must get a lot of readers and appreciation. I am sure you are going to have a wonderful campaign with Blogchatter Projects. Thank you so much Surbhi. And wish you all the best with your project too.